Index of Go Northwest! travel articles. We always want to hear from people who travel or live in the Northwest. Submit your own original work to Go Northwest! See our Guidelines for writers if you have any questions. Have you ever heard the sound of a deep "haah" come out of the blue and looked up to see a hot air balloon floating serenely overhead? Has this sight triggered the thought, "Wow, I'd like to be up there"? When the opportunity to take a balloon ride as part of the 2006 Lake Coeur d'Alene BalloonFest came up, I leapt at it, having had this thought many times before. I am happy to confirm for anyone else similarly inspired, it is well worth saving your pennies for this at-least-once-in-a-lifetime experience. As I suspected from watching balloons from the ground, a balloon ride is an aural as well as visual experience. The brief roar of the gas flame alternates with an expansive silence. This is a form of travel that goes with the wind, so there is no rush of air to provide the sensation of movement. As our ears attuned to the new experience, myself and the other two riders noted the hum of freeway traffic, and even the squeals of children playing. I was also amused to note that our landing was accompanied by the sounds of huffing and puffing of the ground crew who had come running across the field to apply their weight to the dragging basket. The teamwork required to unpack, unfurl, inflate, tether, release, recapture, deflate, re-roll, and re-bag the balloon (along with its basket) is a whole other part of the experience. 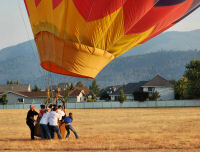 Frank Kafka of Colorado piloted his balloon "Fire & Ice" with the help of a crew of volunteers. The excitement prior to lift-off mounted amidst a flurry of last-minute instructions; strap this here; put weight on there; you check the radios; you drive the chase vehicle. I am guessing the need for instructions was particular to a flight with a visiting balloonist without his regular crew. Once in the air, the teamwork continued as we maintained sight of our chase vehicle and Frank, for whom this was a new route chose a landing spot accessible to the vehicle. It did not occur to me at the time, but you could stay in contact with loved ones on the ground by cell phone should you so desire. Other tips for would-be-riders: a pair of binoculars might enhance the experience; a hat wont blow off when you are in the air but you might lose it on landing; and dress for temperatures as they are on any exposed part of the ground. In the Northwest, choose a flight before fire season starts so there is less haze in the sky. If you can, choose a flight location that takes you over captivating scenery, or perhaps over familiar places that are fun to spot from above. 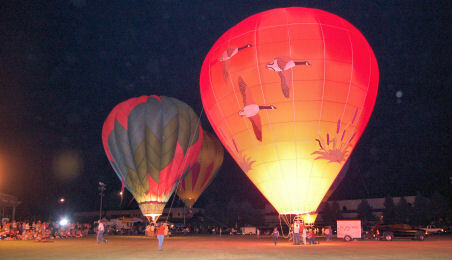 Or, make the experience part of a larger one, such as the Lake Coeur d'Alene BalloonFest. Our late afternoon flight was followed by an evening gathering of lighted, tethered balloons in a luminous display of buoyant elegance. The visuals, of course, were grand. I say this with the benefit of the hindsight of one who was surprised to find herself nearly frozen in position when she fully appreciated there was only a bit of wicker between her and a plummet to the vertiginous ground below (Not to mention only three simple, wooden pegs holding the balloon to the basket!). At take-off, I loved the feeling of the balloon straining beneath the crew, and the unexpectedly gentle ascent once we were released. At 400 feet, and feeling like I was standing on a very crowded balcony of a very tall building, I had the full-body realization that I had just willingly given up all contact with the ground, and was fully dependent on a contraption that had long been a source of fascination. Perched with one hip resting on the rim of the basket, Frank chuckled while he related a story about a previous passenger who, white-knuckled, had not let go of the side of the basket for her entire ride. I then understood that unpeeling my own hand was an option, and I relaxed enough to take photos. I also enjoyed the effect we had on those below, including a pair of horses that fled to the other side of their enclosure. (Frank mentioned he tries to avoid turning on the gas when he is close to animals). Anticipation of our landing brought back a little tension as Frank counseled us to keep our knees bent and hold on tight. He didn't guarantee the basket would stay upright, but after hardly a bump, we only swayed a little while the ground crew clung on. Our landing in a field behind a middle school brought children and neighbors out to see the sight. One little boy, no more than four years old, seemed particularly transfixed. Hands thrust into the pockets of his oversized jeans, and mouth slightly agape, he didn't take his eyes off the proceedings. If witnessing a balloon in the air inspires the observer, what must be the effect of a balloon landing on one's back doorstep? It pleased me to imagine I might be party to an event that saw the balloon bug bite a future pilot, or "balloon slave" as our own pilot's t-shirt read.